Photograph taken in Waterford, Mississippi. 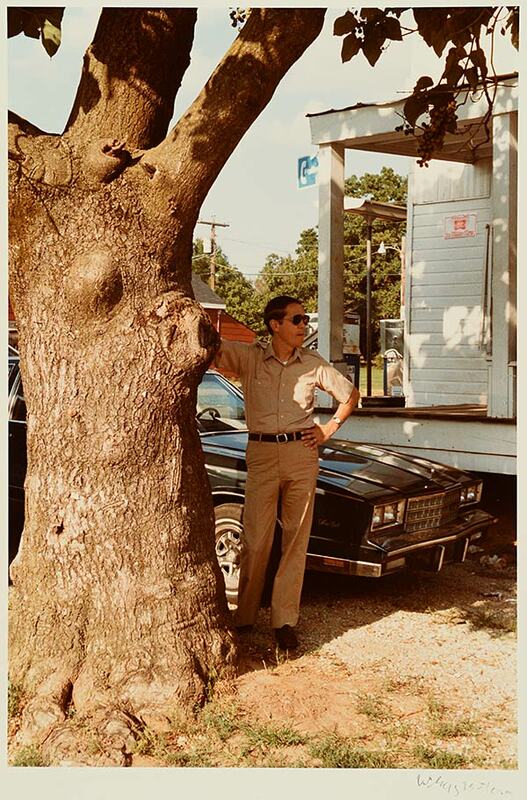 The man leaning against the tree is noted photographer and friend of William Eggleston, William Christenberry. “Young man, you know exactly where to stand with that little camera.” As he observed him taking photographs, Walker Evans’s comment about the way William Christenberry stood with his camera was a subtle way of complementing his artistry, since Evans also knew a thing or two about finding the right perspective. In the 1930s, Evans photographed many of the same spots in Hale County, Alabama, as Christenberry, photographs many of us know from Evans’s creative collaboration with the writer James Agee Let Us Now Praise Famous Men. In 1973, two years before Evans’s death, Christenberry—a Hale County native—took Evans to Alabama with him, leading Evans not only to pay attention to his technique with his toy-like Kodak Brownie but also to encourage him to continue using this very basic camera. Christenberry later worked with an 8 by 10 view camera, but the essence of his work was unchanged. He always knew where to stand. William Christenberry died on November 28, 2016, from complications related to Alzheimer’s disease. What linked Christenberry and Eggleston was not just their lineage to Walker Evans. Christenberry’s photography of decaying structures in Hale County, Alabama, captured the Gothic South and in Eggleston’s work the Gothic and Bohemian Souths collide with the juxtaposition of stark ordinariness and psychic disarray. And Eggleston’s portrait of Christenberry, taken on one of their photographic expeditions, shows that both men knew exactly where to stand.